Also see our Glaucoma FAQ! The word “glaucoma” is like the word “automobile.” Many forms and types exist. Below is a discussion of the most common forms. If you have glaucoma, it is important that you know which type you have. Some forms of glaucoma, for example, can be affected by certain medications. Each of these are discussed below. Just scroll down or click on any of the items below for discussion. It will be helpful if you read the section on Primary Open-Angle Glaucoma before reading about the other types of glaucoma. POAG is the most common form of glaucoma, and usually occurs in adults over the age of 45-50 years of age. It is a chronic problem of unknown cause resulting from increased fluid pressure within the eye which causes damage to the optic nerve and vision. This form of glaucoma is “silent” meaning that there are no early symptoms. The pressure rises slowly, and various components of the eye such as the cornea adapt well without signaling any pain. The disease often goes undetected, and patients can lose large amounts of their vision without being aware of any damage. This is because initial loss of vision occurs in the periphery. It is not until central vision becomes involved that patients realize that there is something wrong. Even then, there’s a tendency to believe that there’s only a minor problem such as needed their glasses adjusted. By then, however, the damage is irreversible. population is 14-16 millimeters of mercury, although the normal range can vary from 8 to 21. Pressures or 22 are considered suspicious, and beyond that point, abnormal. What is not understood well is why persons with clearly elevated pressures do develop optic nerve damage, and why some others do not. This is the subject of active research. 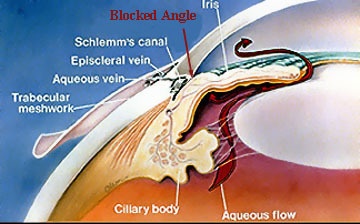 Open Angle Glaucoma: In this type of glaucoma, aqueous produced by the ciliary body cannot exit out of the eye easily because of a blockage at the trabecular meshwork. 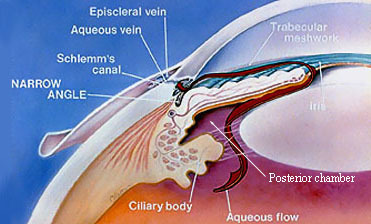 As the ciliary body continues to produce aqueous, the fluid pressure begins to build up in the eye. This can lead to damage of the optic nerve. While there is no “cure” for POAG, treatment is often highly successful is slowing or arresting the disease. Many patients do not understand the necessity for lifelong treatment, especially when they sense that their vision is good, and they “feel” nothing wrong with them. It is important however that treatment is taken according to your doctor’s instructions to prevent further damage. If you are having side effects from your medicines, you need to discuss this with your doctor. If you are not confident with the recommendations or diagnosis, a second opinion may be helpful. By no means should you ignore the problem because of lack of symptoms. Remember, glaucoma treatment is a very individualized process. Please see our Glaucoma FAQ for more details about treatment. be very difficult to diagnose, and is often not recognized until some form of damage results. LTG is becoming increasingly recognized as an important type of glaucoma to look for, especially in persons with vascular disease such as hypertension, diabetes, heart disease, etc. LTG is thought to be due in part to poor circulation to the optic nerve head, making it very sensitive to any form of pressure, even pressure that is well within normal range for the general population. In these very sensitive eyes, it is thought that a pressure lower than normal is necessary to prevent further damage and visual loss. The target pressure to minimize any further optic nerve damage is different for different individuals, and treatment can never be a “cook book” approach. There is much research being done in the field of optic nerve blood flow, and much has yet to be learned about this form of glaucoma. For treatment details, please see our Glaucoma FAQ. In contrast to an open angle, a narrow angle is one in which the peripheral iris lies in very close proximity to the trabecular meshwork. In extremely narrow angles, resistance to fluid flow could lead to increased pressure behind the iris in the posterior chamber. This can result in further narrowing of the angle or even total closure, leading to dangerously high intraocular fluid pressure. Unlike POAG where intraocular fluid pressure rises slowly, in AACG, the pressure rise is sudden and can become extremely high. This results in pain, redness, blurred vision, and may cause nausea and vomiting. The cornea often swells causing halos in addition to blurred vision. (colored part of the eye) and the white part (called the sclera or “wall” of the eye) meet. In some individuals, the angle of the eye is very narrow. This could be as a result of the way their eye is built, or it may be due to problems such as thickened cataracts which begin to crowd the front part of the eye. Under these conditions, anything that dilates the pupil will cause the iris to crowd the angle. Angle Closure Glaucoma: In some cases, the distance between the peripheral iris and the trabecular meshwork can be extremely narrow. Under certain circumstances, the iris can completely and suddenly close the angle resulting in sudden extreme pressure elevation. This is considered an emergency since vision is immediately threatened. 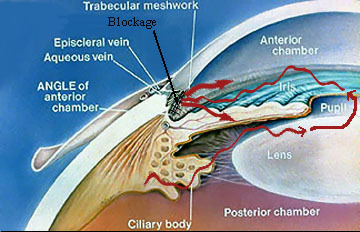 the trabecular meshwork) and decrease the eye’s fluid production. Once the intraocular fluid pressure is within normal range, your ophthalmologist will perform a laser iridotomy. A laser iridotomy is a procedure in which a laser beam is used to create a small opening in the iris, near the angle. This allows pressure to equalize in the eye, and allows the aqueous to flow more freely. This laser treatment is a painless outpatient procedure, and can be done in less than 10 minutes. An attack usually occurs in only one eye, even though it is very common that both eyes have narrow angles. Therefore, most of the time, your ophthalmologist will recommend that the uninvolved eye also undergo a laser iridotomy procedure to prevent such an attack in that eye too. Routine comprehensive examinations can be helpful in determining if an individual is at risk for AACG. If your ophthalmologist is suspicious of narrow angles, he will perform a gonioscopy exam, a painless procedure in which a special mirrored lens is placed gently on the surface of the eye that allows visualization of the angle. (See Diagnostic Services page for a description of gonioscopy.) Patients with narrow angles can then be warned of symptoms. Your doctor may even recommend that you undergo laser iridotomy if he feels that the risk for attack is great. pressure. (See our Glaucoma FAQ for details of the anatomy of the angle.) This is an uncommon form of glaucoma and is usually due to other problems of the eye related to its circulation or even more rare, chronic inflammation. This is considered a type of SECONDARY GLAUCOMA (see below) meaning that NVG has occurred due to another problem with the eye. There are two main circulation problems that can lead to NVG. Diabetic Retinopathy in its advanced form, if untreated, can lead to NVG. Central Retinal Vein Occlusion (CRVO) is a circulatory problem in which the main vein draining blood out of the eye becomes occluded or “stopped up,” leading to a back flow of blood and hemorrhaging into the eye. If severe and untreated, NVG can develop. There are many systemic problems that are associated with CRVO such as hypertension, heart disease, diabetes, and other vascular problems. Rarely does CRVO occur in healthy persons. There are other less common causes of NVG such as carotid artery occulsive disease, chronic uveitis, and others. If caught in time, laser treatment can usually successfully treat NVG. The goal of treatment is to save the eye, not to restore vision since vision is usually permanently damaged by this time. eye cannot drain out into Schlemm’s canal thereby causing increased fluid pressure in the eye. Pigmentary glaucoma is relatively uncommon and occurs more in men than women. It is an inherited form of glaucoma and begins usually in the 20’s or 30’s. Because it begins so early in life, it represents a real threat to long term normal vision. The vast majority of cases of pigmentary glaucoma occur in nearsighted persons. It is thought that in certain nearsighted individuals, the anterior chamber is deeper than normal causing the iris to rub up against other structures in the eye such as the lens and zonules (fibers in the eye behind the iris which hold the lens in proper position). This constant rubbing action causes the iris pigment to flake off into the aqueous. This form of glaucoma can be treated successfully (see our Glaucoma FAQ). This form of glaucoma is common, and occurs in approximately 10% of persons over the age of 50. For reasons that are not clear, a whitish dandruff-like material builds up in the eye and accumulates on the lens surface. As the pupil dilates and constricts, this material along with iris pigment is literally rubbed off the lens and is dispersed in the aqueous (seeÂ our Glaucoma FAQ for details of the anatomy). Both pigment and this exfoliative material clog the trabecular meshwork leading to a build up of fluid pressure. Not all persons with exfoliative syndrome develop glaucoma or elevated pressure. However, if you have exfoliative syndrome, your chances of developing glaucoma at some point in your life are six times higher than if you don’t. It usually begins in one eye long before the other. Therefore, persons with exfoliative syndrome need to be monitored carefully for the development of glaucoma. Fortunately with this type of glaucoma, treatment is highly successful (see our Glaucoma FAQ). Such as a hard blow to the eye, a penetrating injury, severe lye burn, etc. These mechanical factors can cause damage to the drainage structures of the eye resulting in a build up of fluid pressure. A variety of diseases that cause poor circulation to the eye can lead to NEOVASCULAR GLAUCOMA (see above). Glaucoma can be present at birth if the drainage channels of the eye are not well formed. Other birth defects of the eye can also lead to glaucoma. of anti-depressants, and medications for certain stomach disorders such as belladonna alkaloids. Be sure to check with your medical doctor and/or your ophthalmologist if you are taking or plan to take these types of medicines.